Looking for responsive design books? We have a roundup of best responsive web design books for designers. Some of these books are targeted for beginners in web design and others are books for experienced web designers. Responsive design, also known today as the science and art of building websites, has become very popular. The concept coined by Ethan Marcott is becoming very popular with an ever increasing list of developers. With the popularity of responsive web design, the number of books which are being written for understanding and designing the concept is also selling like hot cakes. Here, we offer you a lowdown on some of the best books about Responsive web designs. The book offers detailed information about designing of two websites, such as one for the mobile and the other for larger displays. The book offers you step by step responsive designing of the website through real examples with illustrative screenshots. With the help of this book, you can take web designing to a new level. 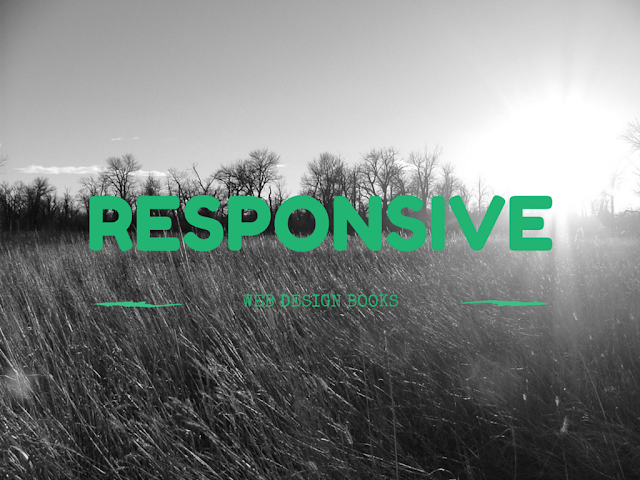 Implementing Responsive Design offers a practical examination of the way websites are being designed and built. So, the readers will get crucial information about various aspects such as building responsive sites by using a combination of fluid media, media queries and fluid layouts. It also offers information about all the issues, which arise during the project. The author explores design principles and CSS techniques which includes media queries, flexible images and fluid grids for the benefit of the readers. He further demonstrates how you can deliver quality experience for the users, irrespective of the size of their device’s display. For that, it is imperative that you need to think beyond desktop computers and think about crafting lovely designs which anticipates and offers response to the user’s requirements. The author offers a comprehensive introduction regarding Responsive Web Designing for the novice user. Today, Responsive Web Design is one of the hottest practices as it cuts down the development time in a tremendous way for all devices. In addition to that, it also prepares your websites for future use. This is one of the best responsive design books in the market. The author explains about the working of responsive web design and takes the readers through a responsive workflow which starts from project kickoff to the website launch. This book is an ideal choice for any person who is involved in website creation process. This book offers you information not just about fundamental techniques and strategies for using CSS and HTML for creation of websites regardless of screen size, but also offers progressive enhancements for better user experience. The predominant purpose of this book is to teach how to make apps, create digital content and how to build websites for every type of media vehicle. The company Noble Desktop also offers various types of classes in these subjects for aspiring developers. This book skips theoretical jargon about the subject and offers practical knowledge on designing the responsive web design for live projects. This book also offers new strategies with which you can resolve browser incompatibility issues for various apps. The book provides innovative ways to integrate various design techniques as well. This is a list of some of the best responsive web design books for designers available in the market. These books are popular with people working in this field. Responsive Web Design offers great designs for every device, which offers easy access to the internet through touch-screen devices such as tablets and smart phones, besides traditional media such as desktop and laptop computers.